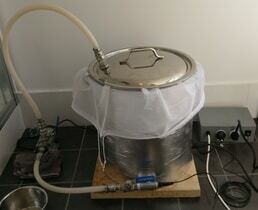 Like most home brewers, we started off by making simple brews from can kits. Then making the progression through adding additional malt extracts to specialty grains and hops on the stove. We were starting to produce some tasty beers, but still not as good as some of our mates who were already doing all grain brewing. So, we decided to take the plunge into going all grain ourselves, but where do we start? All we had was fermentation related equipment. After a fair bit of research to see what was available on the market, including the all in one brewery systems, we decided that the only way to get all the features that we wanted was to build our own brewery. This meant buying the parts from multiple different websites and having to wait for the various packages to arrive to finally build our all in one brewery. However, after the effort of getting all the parts we needed, we built a brewery exactly the way we wanted, catering to the available space we had to brew in. We finally got to brew that Oatmeal Stout that we had wanted to do for so long. Getting to taste that brew and share it with our mates a few weeks later was a great reward! Mash to Brew was born to reduce the time and effort required to source parts to build your own brewery at home. We have had temperature sensors custom made, electric heating elements tailored to suit Australian/New Zealand power standards and only source fittings with BSP threads. We aim to supply high quality parts all from one location to ensure that our customers can be confident in their build on brew day.